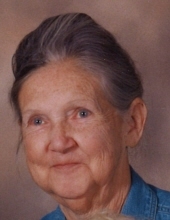 Nellie Virginia (Bowen) Woods, 80, widow of Marshall Woods, of Mt. Sidney, passed away Monday, October 29, 2018 at her residence. Mrs. Woods was born on December 8, 1937 in Augusta County, a daughter of the late George W. and Margaret L. (Sipe) Bowen. Nellie loved reading books and writing short stories about her family. She enjoyed hiking, embroidery, and cooking and baking for her family. In addition to her parents and husband, she was preceded in death by a sister, Ellie Helmick. Surviving are her children, Tom Bowen of Verona, Betty Lou Woods, Lillian V. Woods, and Robert Woods, all of Mt. Sidney, and Deborah “Jane” Wilberger of Weyers Cave; siblings, Buddy, Hank, and Doris Bowen, all of Verona; grandchildren, Travis Jerome Wilberger, Emily A. Briggs and husband Chris, and Jason B. Wilberger; great-grandchildren, Connor J. Briggs, and Lucious and Bayleigh Wilberger; and numerous nieces, nephews, and special friends. The family will receive friends from 6:00-8:00 p.m. Friday, November 2, 2018, in the Coffman Funeral Home and Crematory. A Celebration of life will be conducted 1:00 p.m. Saturday, November 3, 2018 in the Coffman Funeral Home Chapel by Matt Bowen and Ronnie Strickler. Burial will follow in the Craigsville Cemetery. Active pallbearers will be Randy Harris, Paul Harris, Keith Wampler, Jerry McLain, Phil Garber, and Tommy Dodson. Honorary pallbearers will be members of the Verona Volunteer Fire Company. It is suggested those desiring make memorial contributions to the Verona Volunteer Fire Company, P.O. Box 348, Verona, VA 24482 the Weyers Cave Volunteer Fire Company, 1235 Keezletown Road, Weyers Cave, VA 24486. To send flowers or a remembrance gift to the family of Nellie Virginia Woods, please visit our Tribute Store. "Email Address" would like to share the life celebration of Nellie Virginia Woods. Click on the "link" to go to share a favorite memory or leave a condolence message for the family.